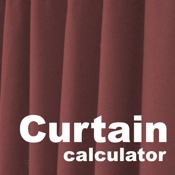 This is the perfect app if you need to calculate the approximate amount of material / fabric required for a pair of curtains / drapes, This app could easily pay for itself in one use as it can help reduce wastage. Working in both metric (cm) and imperial (inches). Enter the track size, required curtain length, hem length, pattern repeat (if any) and fabric with and by selecting the fabric heading / fullness, the app will tell you the lengths of material / fabric required in addition to the amount of material fabric required. This app quickly and efficiently calculates the results allowing you to quickly identify the approximate amount of material required and therefore reduce wastage. 9 preset heading / curtain styles for quick entry. 5 standard fabric widths for quick entry - in addition to being able to enter your own. 3 standard patter repeats - in addition to being able to enter your own. Please note that the calculations generated in this app are to be used as a guide only and you should always seek the advice of a professional before making any purchasing decisions. While the developers of this application make every effort to deliver high quality products, we do not guarantee that our products are free from defects or errors. Our software is provided “as is," and you use the software at your own risk. We recommend that you seek the advice of a certified professional before drawing any conclusions from any calculations generated from the software. No oral or written communication from or information provided shall create a warranty. Under no circumstances shall the developers of this application be liable for direct, indirect, special, incidental, or consequential damages resulting from the use, misuse, or inability to use this software, even if we have been advised of the possibility of such damages. The developers of the software cannot accept liability for any loss, damage or injury as a result of using the results generated from our software.